Bornprettystore.com contacted me a few weeks ago to try one of their women's watches and review it so I chose this black one, perfect for an everyday look. What I love most about it is that it's basically 2 in 1. That means that you buy the watch and you also get bracelets attahed to it so that in the morning you don't have to waste time searching for the perfect jewelry to compliment your outfit. I also like that it has a simple design, without rhinestones or bright colors and you can also find it in white. It costs 7.99$, but the quality is good and the shipping is free so that's another bonus. At Bornprettystore you can find a wide selection of products including: makeup, jewelry, led watches, clothing, hair extensions, iPhone 5 cases, nail art with prices starting under 1$. They also made a special coupon for you, my beloved readers, so use the code SAC10 to save 10% on your oder. you look just great, love your blouse and your accessoires! Your stripes blouse is really amazing! Hello lovely, thank you for the sweet comment on my blog! I adore your watch review, is so cute. it's my pleasure to vote for you:).. I love our new outfit! Love the shirt and the watch! So nice from bornprettystore! Best wishes! Following you on GFC! Have a great weekend! This is stunning I want one!!! Stylish! I'm enchanted to the accessories, fabulous! Would really appreciate it if you could check out my blog. This is a really pretty outfit! I love the watch! The watch is lovely and the whole outfit as well. Great job Adri! The watch is so pretty! I like a lot the outfit, and the watch is really awesome! great outit! love your accessories! adore the shirt and the arm candy, thanks for stopping by my blog. You look really elegant my dear! You look fab, dear! Love your blouse! Great outfit and lovely watch! 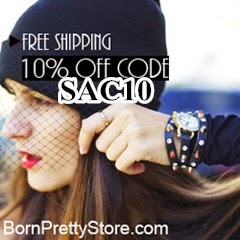 I'm cooperating with bornprettystore too, they have amazing items!!!! Great outfit and I love the watch! I love your blog and I have started following you with Bloglovin. If you ever have chance to look at my blog I would be delighted. Thanks! I love your style! Would you like to follow each other?